Bordeaux is a magical city for family holidays in France. Here are some of our favourite kid-friendly things to do. From its beautiful old city centre architecture to the safety of its car-free riverfront, Bordeaux is the perfect place for family holidays. No visit to Bordeaux would be complete without a run through the city’s famous Miroir d’eau. It’s the world’s largest reflective fountain pool and it’s impossible to miss in front of Place de la Bourse. It comes to life as water disappears into the ground only to reappear as a misty haze that’s both magical and fun. Bring a spare set of clothes for the kids – don’t say we didn’t warn you! 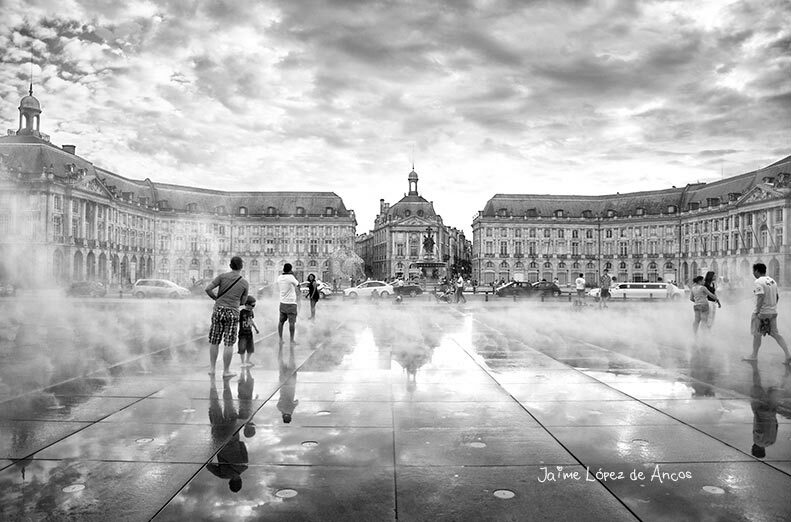 Bordeaux’s Miroir d’eau. Photo by Mutelot. Further along the waterfront are the old hangar at Chartrons, the city’s old wine centre. 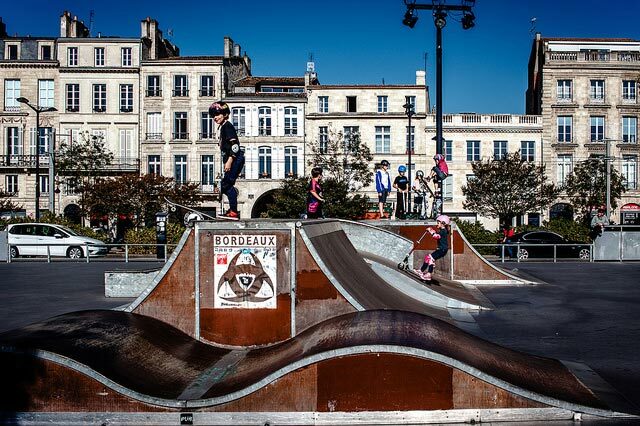 It’s now home to Bordeaux’s skate park. This is a hive of activity throughout the week, but it’s especially vibrant at weekends and on summer evenings. Bordeaux is a city that embraces. Nowhere is that more evident than at the skate park. Family holidays in Bordeaux come alive here. There are ramps, jumps and bumps for skaters and scooters of all ages. You can start at the small beginners’ park for tiny kids and work your way up to the pro-bowl for seasoned skaters and BMX riders. There are rental shops nearby for hire bikes and scooters, or you can simply sit and watch the action. Fun for all ages: the skate park in Bordeaux. Photo by Joseph K Laespiralde. For more adventure there’s zip-wire fun in the trees south-east of Bordeaux at Arbor et Sens. Anyone aged four or over can be Tarzan for the day. There are similar set ups just north of Bergerac at AccroZarbres, near Arcachon at Bassin Aventures and near the coast at Biscarrosse, La Porge and Carcans. For fairytale castles you’re spoiled for choice. Any number of chateaux in the Medoc will inspire awe. However a few are especially tailored for young adventurers and family holidays. Chateau de Vayres is within easy reach of the vines at Saint-Emilion and Pomerol. It has summer night-time opening and a selection of games for future knights and princesses. It was once owned by King Henry IV. To go wine-tasting, there’s Chateau Bardins. The Pessac-Léognan wines themselves are strictly for the adults, but there’s a treasure hunt for the little ones with fresh fruit juices flowing at the end. For pure fun, though, it’s hard to beat Chateau Bridoire and its maze. This is just east of Saint-Emilion and a short drive from one of our favourite sweet white wine haunts, Monbazillac. The 12th century fairytale Chateau Bridoire offers families the best of both worlds. The chateau itself is full of enough beautiful furniture and works of art to keep mum and dad impressed while the kids are off playing life-sized games in the gardens. This is a real wonderland, complete with a maze to get lost in and explore. There are also night sessions in summer when the chateau is illuminated. Just magical! You’ll find magic of another kind at CAP Sciences in Hangar 20 on the Bordeaux riverfront. Bordeaux’s fabulous science museum is on the corner near the new Jacques Chaban-Delmas bridge (itself a wonderful sight when open). It’s also a short walk from La Cité du Vin. CAP Sciences is dedicated to scientific and technical events and activities. For 2017 there’s an interesting show on called Luminopolis, where you have to navigate through a city of lights. For peace and quiet, head to the botanical gardens on the opposite side of the river to the city centre. The Jardin Botanique Bordeaux Bastide is a lovely place for a picnic. It’s also an ideal place if you need some time out to walk a little one to sleep in their pushchair. Entry is free. You can walk from the city centre or take tram line A. There’s also the wonderful Jardin Public, which is closer to the city centre. There’s a carousel and a small children’s playground, plus a café. Parc Bordelais, meanwhile, is the place to go for larger climbing frames, a small animal enclosure and holiday activities such as theatre performances. For more animals, go to the zoo at Pessac. It’s top of the excursions list for area schools. There’s even a ‘caretakers for a day’ scheme so kids can experience the zoo from behind the scenes. Further afield there’s an excellent zoo in the stunning bay area of Arcachon. Meanwhile in Cadaujac, you’ll find the Ferme Exotique (Exotic Farm). Wind your way along a 2km trail getting up close and personal with almost 1000 animals from across the globe. There are also some rides and a small pool during the summer months so you can all cool down. Speaking of cooling down, Aqualand is at Gujan-Mestras, near Arcachon. This is a great place for family holidays and perfect on a hot summer’s day. There’s a plethora of waterslides and pools. Don’t forget the sunscreen! Next door to Aqualand is La Coccinelle, a mini adventure park and farm for smaller kids. Still on the water is the river bus. The Garonne river ferry is a great way to get a unique look at the city centre. You simply buy a ticket on board. You can take a tram to one end of the river and get the ferry back using the same ticket if both journeys start within the same hour. Back on dry ground, we love the Wave Surf Café in the middle of town. 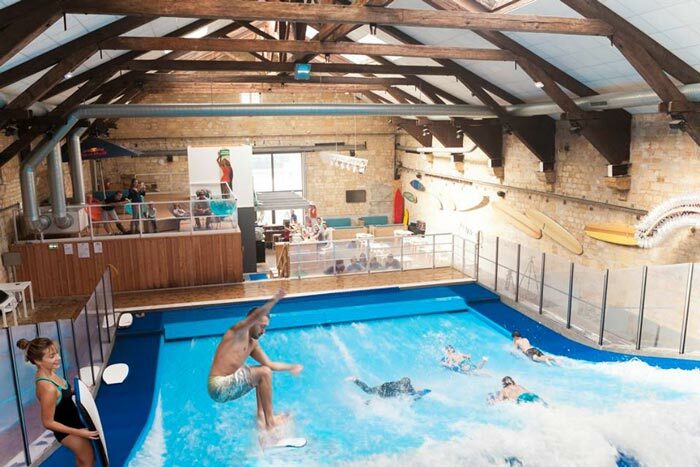 It’s got a surf machine in house so the kids can try surfing or bodyboarding while you sip an espresso. The café also offers 30-minute surf lessons. The Wave Surf Cafe in Bordeaux. Want real beaches? We’ve got those covered too. Then of course there’s the golf. While we have some of the best courses in the world for mum and dad, there’s also this little gem hidden away in the hills east of Saint-Emilion for kids and complete beginners. There are just 9 holes at Saint-Méard Golf Club and the facilities are pretty basic. But this is the perfect place to help make your young golfers feel part of your family holidays in France. There’s a driving range, putting green and golf clubs for toddlers through to grown ups. We can include any of these ideas in your Bordeaux family holiday itinerary. We can also reserve tables at Bordeaux’s best family-friendly restaurants and arrange childcare if you’d like to hit the greens without the kids in tow. All you have to do is ask.